General Secretary of the INMO Phil Ni Sheaghdha at the protest Saturday. THE NURSING PAY deal is set to cost an additional €10-€15 million this year with additional costs of €30-35 million in 2020. Speaking this afternoon, Finance Minister Paschal Donohoe confirmed the figures following the suspension of the nurses’ strike after Monday evening’s Labour Court recommendations. Meanwhile, the HSE has said it is endeavouring to restore services to normal after the suspension of three planned strike days by nurses and midwives. 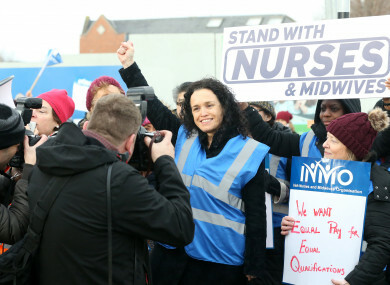 The Irish Nurses and Midwives Organisation (INMO) suspended the upcoming strikes at the request of the court to consider the “wide-ranging recommendations”. These recommendations made progress across all areas of concern, the INMO has said, including “the key areas of safe staffing and addressing recruitment and retention problems”. The union also said there were proposals for “significant changes to salary scale and allowances”. The HSE said with nurses and midwives fully attending work this week, it expects outpatient appointments to go ahead as planned. Anyone with an appointment for today, Wednesday and Thursday is advised to attend. “We expect that Emergency Departments will be extremely busy and we would ask the public to only use these services if absolutely necessary,” the HSE said. Laying out four key areas of “productivity savings”, the court’s recommendation “will allow movement into the different nursing grades,” he said this afternoon. Email “Nursing pay deal set to cost €10-€15 million this year and €30-€35 million in 2020”. Feedback on “Nursing pay deal set to cost €10-€15 million this year and €30-€35 million in 2020”.